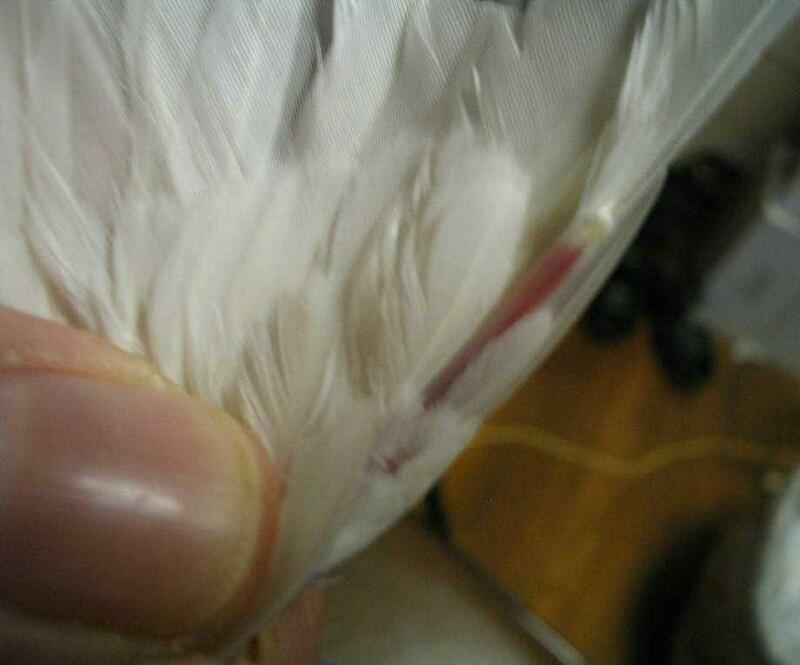 You might already know what a blood feather looks like. I didn't until I saw one for myself (and then made the stupid mistake of cutting it; that's one mistake I'll never make again!). This is what it looks like. 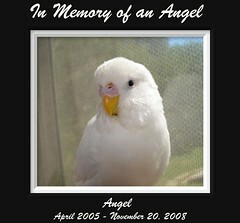 Granted, not the best picture but Angel (my white parakeet who's more devil than angel) did not like this at all (the postion one must hold a bird to see this) so I had to be very quick. 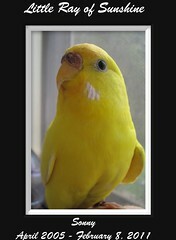 If you trim your birds flight feathers, you will inevitably see one of these. When you do, DO NOT cut it! If you do, it'll bleed, and if you're not expecting that, (as I wasn't), it could be a scary experience. 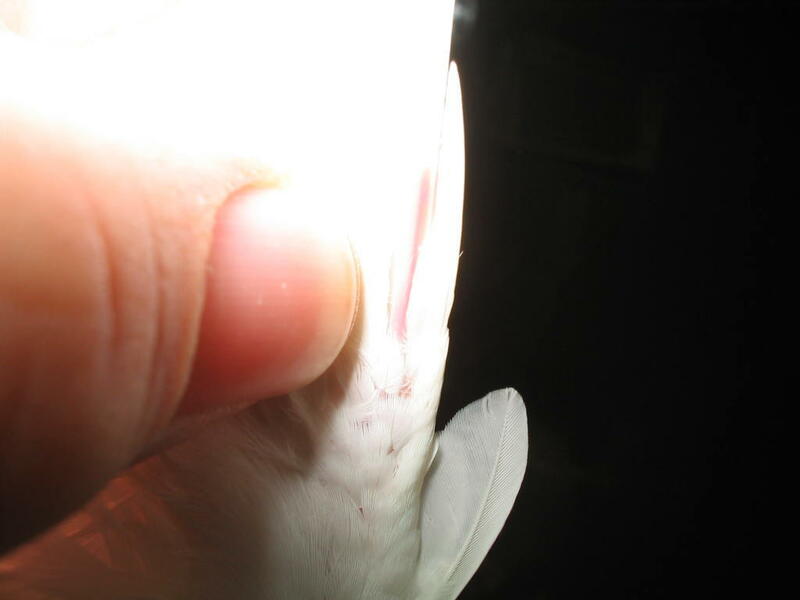 When this happend, I brought Angel to the bathroom sink to try and rinse the spot and then held my finger on her wing (on the bleeding spot) until the bleeding stopped. All while trying not to panic and trying to keep her from flying away. (more things she didn't like.) A pinch of flour or some styptic powder (the kind made for birds/pets) would've been better probably. But at the time, I just wanted the bleeding to stop and applying pressure works for humans, so I hope it would work for her. It did. 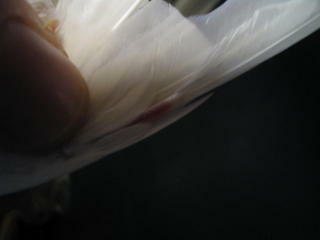 She was ok afterwards, but if I hadn't stopped the bleeding quickly, she could've bled to death. Terrible to think about. Lesson learned! Do not cut blood feathers! Now when I trim their (Sonny or Angel's) flight feathers, I check first to make sure none of them are blood feathers.